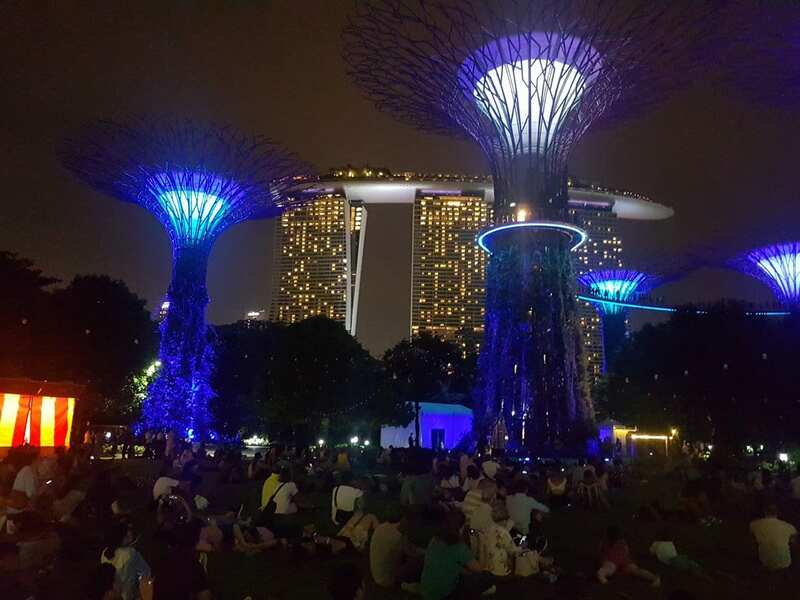 Gardens by the Bay Light Show in Singapore- Supertrees from Avatar! 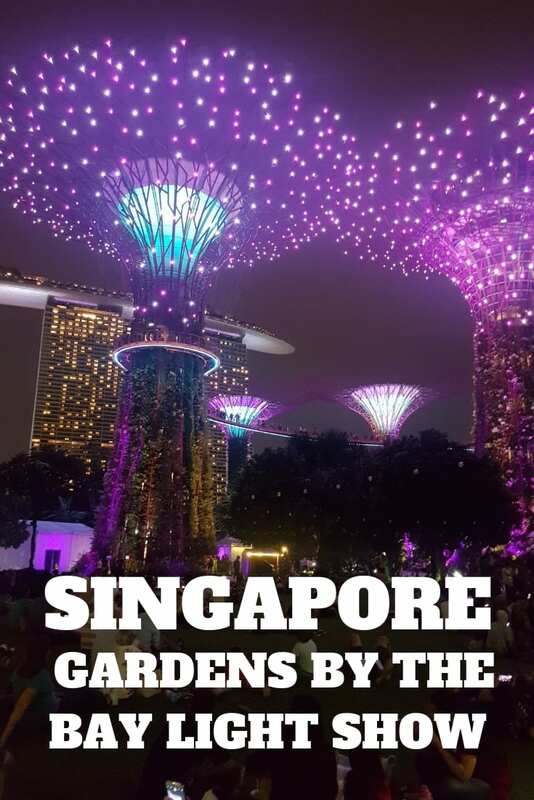 Gardens by the Bay Light Show in Singapore – Supertrees from Avatar! The Gardens by the Bay Light Show is a must see for anyone visiting Singapore. Here's all you need to know about seeing the Gardens by the Bay Light Show in Singapore. If you've read up a little about the Gardens by the Bay Lights Show in Singapore, but never seen it for yourself, you may be forgiven for thinking it's a little corny. And I suppose it is, a little. Whatever you do though, don't decide on giving it a miss. The Gardens by the Bay Light show really is a highlight of visiting Singapore, and seems to sum up this small, quasi-futuristic country perfectly. It's like being on the set of Avatar! Want to know what all the fuss is about? Check out my short video of the light show at Gardens by the Bay below. As I visited Singapore in November, the music is Christmas themed! The visiting hours of the gardens themselves vary for different days of the week. From Sundays to Thursdays the entry starts from 10 am and the maximum exit time is 1 am. On Fridays and Thursdays, the entry time remains the same but the exit time is extended by 1 hour to 2 am. Note: The domes may close much earlier than the Garden's closing time. There are two Gardens by the Bay evening light shows per day. The first supertree light show starts at 19.45 and the second one is followed an hour later at 20.45 every day. The majority of the park is freely accessible. There are only two blocks you need to pay for, and these are an entrance fee to the two domes at the Gardens by the Bay, and the Supertrees Walkway. During the 2018 festive season, they also offered a ‘Christmas Bundle'. This is designed for fun activities and a complete tour of the garden including their new presentation called the Christmas Wonderland 2018. The cost of the ticket starts from $14 during Christmas. The Gardens by the Bay Light Show is free to view for anyone in the park (and probably outside too!). You will see people start to gather on the grass area in front of the supertrees as the sun begins to set, and the lights of the trees go on. Additional costs: A standard scheme provides access to the massive domes which are the Flower Dome and the Cloud Forest in the Bay South garden. The cost per ticket is $10 for children and $15 for adults. We paid to go into the domes, and I thought it was certainly worth it. The scale of these places was incredibly impressive! Find out more at the Gardens by the Bay website. The Giant Supertrees at the recreational area are perhaps the site's greatest and most popular attraction, and the site of the Gardens By The Bay light show extravaganza. These 12 structures are tree-like constructions made out of steel, but which have all types of plants and flowers grown upon them, making them vertical gardens. The Supertree Grove is home to a multitude of exotic and unique ferns, orchids, vines, and other plant-life. The environmental technologies they carry mimic the ecological functions of natural settings such as sunlight absorption for power provision, water collection for the purposes of irrigation and fountain operations, and the intake of and expelling of air to provide air conditioning in the gardens. During a cloudy day, the supertrees look almost sinister! Of course, it is at night when they are in their full glory. Lit up from the lights within, and truly spectacular! 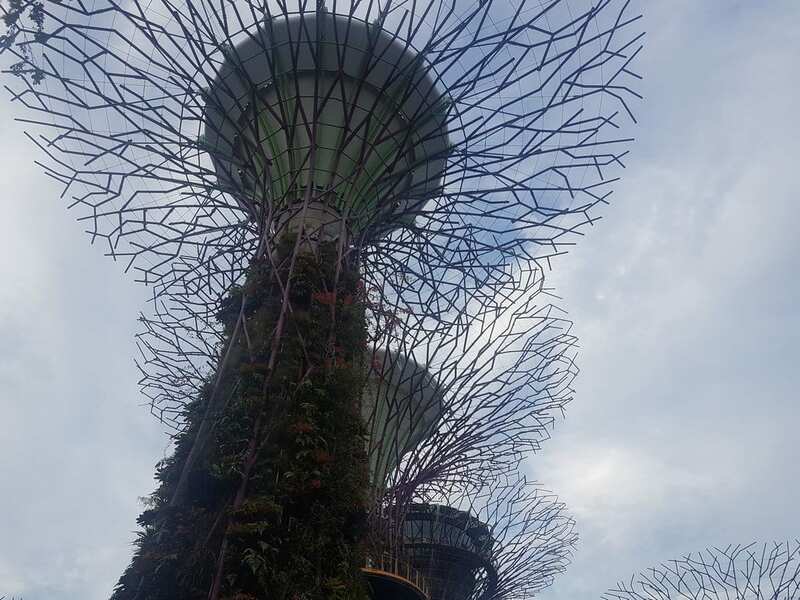 The elevated walkway that runs among the Supertrees is a must-see for anyone visiting the gardens for the panoramic view it affords visitors of the entire span of the area. You can access the Supertree Walkway (extra fee) from between 09.00 and 21.00. Having visited, I would say that it really only makes sense to use the walkway just after the sun sets. We managed to time our use of the walkway perfectly. After sunset, the lights of the supertrees came on, and we were literally walking among the lights with incredible views over Singapore at night. We finished our time on the Supertrees walkway with 15 minutes to go before the first light show, and then found ourselves a good position in the gardens from which to watch it. The light and sound show is the major attraction in the city. There are gigantic trees made of steel that reach a height of 25-50 meters and are fused with a countless number of mini-lights which comes to life when the sun sets. The lights blink in sync with the music and create a trance-like environment with visitors staring at those huge blinking structures in awe. There is a cone-shaped structure on top of every supertree which has vibrant colors. 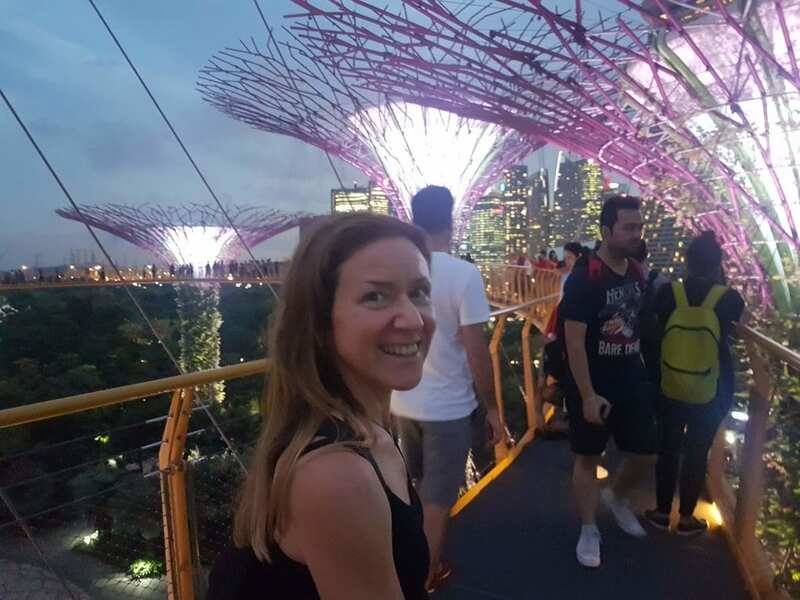 The most astonishing fact is that the supertrees are environment-friendly and store electrical energy through solar panels which power the millions of lights throughout the massive gardens. The Singapore Gardens by the Bay light show lasts for about 15 minutes. The best place to watch it, is from a grassed lawn area area just in front of them. You will see people begin to gather up to half an hour before. Handy tip – You might want to take something to sit on such as a sarong or sheet. I'm pretty sure I saw some people having a picnic in front of the supertrees! Located in 18 Marina Gardens, Dr, the place is easily accessible by bus, trains, and cars. You can make use of the Downtown Line or the East-West Line to reach the nearest MRT station from which it is walkable to the gardens. Sharing is caring and all that. Please pin this post for later!